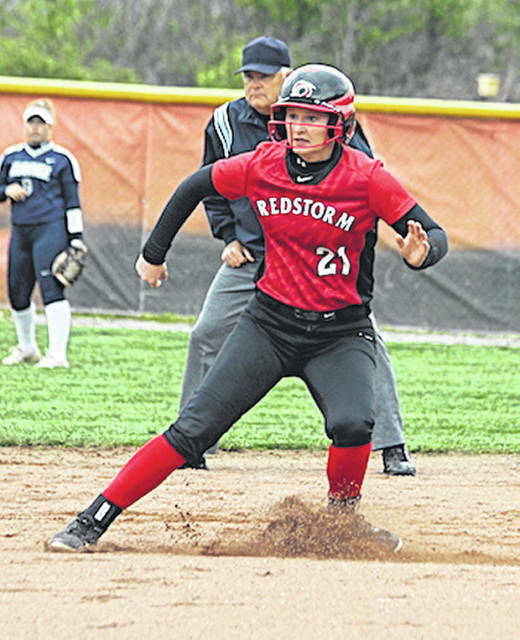 Rio Grande’s Taylor Webb puts on the brakes after rounding second base in Monday’s game one win over Shawnee State University at Rio Softball Park. Webb, a freshman from Willow Wood, Ohio, had four hits and five runs batted in as the RedStorm swept the Bears by scores of 6-2 and 10-2 in five innings. RIO GRANDE, Ohio — Taylor Webb fueled the University of Rio Grande’s offensive attack, while the duo of Kelsey Conkey and Raelynn Hastings authored strong pitching performances to lead the RedStorm in a sweep of rival Shawnee State University, Monday afternoon, in non-conference softball action at Rio Softball Park. Rio Grande posted a 6-2 win in the opening game and recorded a 10-2 mercy rule-shortened victory in five innings, improving its overall record to 27-11 in the process. Shawnee State finished the day at 18-15. Webb, a freshman from Willow Wood, Ohio, homered – the first of her collegiate career – doubled and drove in a pair of runs in the opener, while collecting two more hits and driving home three more runs – all on a double which capped an eight-run, game-ending fifth inning uprising. Conkey, a senior from Minford, Ohio, allowed seven hits and fanned three in the opener, collecting her 11th win in 15 decisions. Hastings, a sophomore from Commercial Point, Ohio, allowed five hits and only one earned run, while striking out six over five innings in the game two triumph. Rio Grande scored three times in the first inning and twice in the second inning of the opener and was never headed. Freshman Kenzie Cremeens (Ironton, OH) went 3-for-3 and hit her team-best 11th home run in the win, while Conkey went 2-for-3 with a double and a run batted in. Sophomore Mary Pica (Minford, OH) also had a double and an RBI in the winning effort. Haley Rawlins went 2-for-3 and drove in a run for Shawnee State, while Stacy Trenholm also had a pair of hits and Gracie Keplinger had an RBI double. Marisa Brown added a double of her own in a losing cause for the Bears. Paige Oldham started and took the loss for SSU. Game two was a 2-2 deadlock until Rio Grande exploded for eight runs in the fifth to invoke the mercy rule and secure the sweep of the twin bill. Senior Carly Skeese (Newark, OH) homered and clubbed a three-run double in the victory, while sophomore Aubrey Azbill (Miamisburg, OH) went 3-for-3 and drove in a run. Conkey again was 2-for-3 with a double and a run batted in, while Pica was 2-for-2 and Cremeens drove in a run. Ashtyn Saunders had two hits, including a double, and drove in a run for Shawnee State, while Tori Bevington doubled twice and Brown had a double of her own in a losing effort. McKenzie Whittaker started and went the distance in the loss for the Bears. Rio Grande is scheduled to return to action on Wednesday afternoon when it travels to Toledo, Ohio to face Lourdes University. First pitch for game one is set for 3 p.m.